plan 197Well construction, repairs, maintenance and Hygiene Education for sustainable water-supply. The project in it's implementation will work closely with the communities to achieve the aim of providing pure drinking-water. From the information collected during a survey, it will be ensured that communities that are badly deprived of safe drinking water will benefit from this project. The technologies used involves maintenance kits for each community and India Mark II pumps for the new wells and old wells without pump. The only physical things handed over to the beneficiaries in this project are the constructed and repaired water-wells and the maintenance kits for the communities. Construction and repairs of wells will be done collaboratively with the community members, who will also be responsible to monitor and supervise all activities together with the SFYDP staff. Since the projects aim is to complement the governments effort to provide pure drinking-water in the rural communities, the project collaborates with the local council and the programs of the Ministries for Energy and Power as well as Health and Sanitation. During the maintenance training, hygiene and sanitation principles will also be taught. 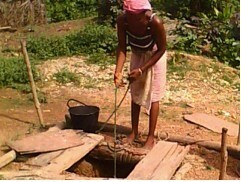 At the same time we will train the participants in different household water-treatment methods. Each community will be trained in maintenance principels and encouraged to contribute at least 300 Leones per bucket to cover maintenance and repair costs. Please find the cost details in the attached budget. 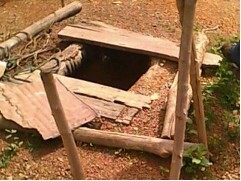 The communities will contribute local materials like sand and unskilled labour in case their well needs to be repaired and the materials are available in the particular area. They will also take care of the store rental in the rural communities. Congratulations Safer Future Youth Development Project (SFYDP for job well done in provision of safe drinking water to schools and the community in Sierra Leone. •	We have noted that your Community members are involved in the construction and totally responsible for the maintenance after completion. If this is so, how come you are requesting US$ 13,057 for wells maintenance? You could also cut costs by borrowing some working tools from the community such as jerry cans, shovels, pick axes, tape measures etc. •	Your communities are also trained in the correct utilisation of the water source, informed about hygienic standards as well as water chlorination through workshops where the awareness of the entire community is guaranteed. We have noted that during the maintenance training, hygiene and sanitation principles will also be taught where you will also train the participants in different household water-treatment methods. We were expecting an item in your budget to take care of capacity building, or are all the people well trained? •	Comment more on how you undertake community mobilization. •	How do you impart community ownership of the water projects? •	The community contribution of only US$3,700 is rather low compared to your total budget. Are you sure that you have included the opportunity costs incurred by the community when attending capacity building sessions? * Before our intervention in any of the communities, we do hold series of meetings to know exactly their priority among items of problems they want to see addressed and what contributions they could offer in terms of labour, materials etc. It is based on what they have and can offer that we prepare our budget. * We did not include cost on our household water treatment training because it could be done without extra cost and the essence of the training is not just to train them about the technology but to create the awareness within the communities in taking the lead after having the knowledge without any external intervention. This system is in its pilot phase. Let us see if it works well or else we will include cost as support for future projects. * Monitoring is done collectively with a committee that is set up by the community with a representative of all stakeholders(The youth, elders, women, and the local administration council). Safer Future after completion of any of its projects pays alternative visits within a period of one year and at the end develop a questionnaire which could be used together with the setup committee to evaluate what impact has been created over the years taking cognizance of their previous status before the intervention in the community. * In community mobilization a thorough survey is done using stakeholders representing each community to assess and identify their felt needs through holding of meetings and the involvement of the people in all decision making, planning unto implementation stages. *Total involvement of the community people in the planning and implementation of our water projects through a setup committee with 75% representation from the community,instilled in them total ownership. A team of young people selected by the community are trained for the repairs and maintenance of our community water points through the community management committee and the local council from funds raised as contribution for maintenance and repairs. * On community contribution, it was based on only what they could offer exclusive of opportunity cost in the attendance of capacity building sessions. There are lots of sacrifices done by the project and the community whose cost are not included simply because they are indirect cost that could not hamper the implementation. However, we will try to include such costs in similar future projects for the benefit of the community. also, what kind of water testing are you using? Who will be conducting it? Great to read about your project! I always have a soft spot for projects engaging youth! Thanks Beatrice for really comprehensive questions. Doesn't leave much for the rest of us! - I was wondering, do you have to hire outside contractors to drill wells? If so, are there local ones or do they have to come from another region? 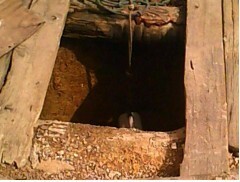 Are they deep or shallow wells? - is there an existing entity in the community that will be in charge of the system, or are you creating one? - Can you tell me the average income of the community? Is 300 affordable? How did you come up with the costing? How many people must pay monthly in order for this project to be sustainable? How will you collect fees? Who will be in charge of the finances? Is it an organization that will be developed in the community? Already existing? Members of SFYDP? *In some communities, there are already existing structures except for those without, we will have to guide them establish one and sensitize them on how to manage the systems. The sensitization we can do in all communities even when there is an existing one already. * The average income per person (per day) in the communities is Le 5,000(USD1.61). So they can afford paying the Le, 300(10 cents). - The cost is from the beneficiary communities through a ballot system if there are differences in the suggested fees. - Contributions from half of the number of beneficiaries in each community can be enough to sustain the project in their locality. -Fees are collected by the financial secretary of each village committee in cash or kind either daily or monthly as agreed by communities. -The treasurer in each established village committee will be in charge of finances collected. I looked through your earlier application which was approved and the project report. Unfortunately, the details are very scant on what actually happened, the results at the 30 villages, learnings, interviews, photographs (before and after), etc. So, while this application appears good, i would really like to see the results of your previous work, or its current status to determine how effective this approach is. The information from that project might also answer questions people have mentioned above. Thanks Rajeshji. Actually we have problems in our Internet services but all projects are completed and the project is working assiduously to upload completed reports with attached pictures. We shall also try to do some interviews, which will be later uploaded. We are sorry for any inconvenience caused. Actually we have problems in our Internet services but all projects are completed and the project is working assiduously to upload completed reports with attached pictures. We shall also try to do some interviews, which will be later uploaded. Dear Idris are the following are Phases or activities? It was a mistake. It should be three of our activities. You have mentioned that 3060 people will get sanitation. However, i don't see anywhere any mention of sanitation. Its not present in the budget. Please present sanitation details or edit the application and remove the number for sanitation. Thanks. You have mentioned that 3060 people will get sanitation. However, i don't see anywhere any mention of sanitation. Its not present in the budget. Please present sanitation details or edit the application and remove the number for sanitation. Indeed, we have already triggered the selected communities and they are presently constructing local toilets through a community Led Total sanitation Project we are implementing with them. So they are sure of having sanitation except for the drinking water, which we are now asking for funding. But it is not part of this application or budget so if anyone sees the numbers and impact, they would be misled. Am happy to work with you to see how to get all the other projects onto PWX, but please correct this application. Hi Rajeshji. It will be edited as advised. Thanks. It will be edited as advised. It is seen to be beneficial for the community. Thanks for all the thought and energy you put into your application. My main concerns with the project are concerned with ownership and the budget. Based on your proposal, it shows that communities will be providing labor and materials such as sand, but $800 is budgeted for sand at each water point. I think it would strengthen the proposal if you included more specifics about how your organization plans to work with communities to form committees for both new and repaired hand pumps. 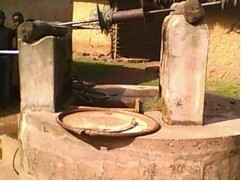 Collections of funds on a per bucket basis may be difficult unless the water point committee has a very strong presence and reputation in the community. If the community has funds that would be available to pay for water, I think it would be a very significant gesture if some of those funds could be collected in order to help pay for the drilling or pump repair cost. Additionally, I think your proposal would be strengthened if there was some mechanism to reward good community participation and not excuse communities that did not meet their commitments. It appears based on your application that communities would end up with a water point in the end, even it they do not fully contribute their part (ie- prepaid sand and labor). Regarding the budget, there are several confusing aspects. I don't understand why 10 sets of working tools need to be purchased for 4 rehabilitations and 6 new wells. Also, it is not clear to me that a full new Mark II pump must be purchased for each repair. More generally, $3,600 seems like a very high price per pump repair. I believe that the organisation has good ideas and once they improve on community participation they will suceed. The other project report is incomplete and unclear, even though the project was supposed to have been completed December 2008. So there is no way this application should be approved at this point in time. I very much like the model of engaging youth. I think the program really prioritizes community ownership and fostering local expertise. Great job!